When was the last time you went busking??? – music. travel. repeat. Just found this deep in the internets…Damian Rice and Glen Hansard “busking” on Grafton St in Dublin, Ireland singing Rice’s “Blowers Daughter” and then transitioning into Radiohead’s “Creep”. What is “busking” you might ask? Just another word for street performing, we just dont really use it here in the US. Busking on Grafton St is not an uncommon tradition, and Christmas Eve seems to be a special day for this. 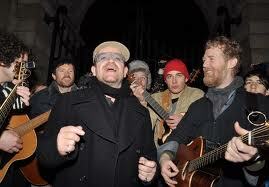 Damian Rice and even Bono have turned up to busk in recent years. You can check out Bono’s busk below too which is pretty amusing as he forgets the words to “One” twice. It then segues into “Knocking on Heavens Door” which is cool. Its all for a good cause though as proceeds from these busks go to aid homeless people in Dublin.